Celebrating SF Open Studios, we are having a sale of Gage's older work to make space for his new works! The sale will be held at ArtZone 461 Gallery, 461 Valencia Street, between 15th & 16th Streets, in the Mission. The selection ranges from large paintings to works on paper and from developed paintings to loose sketches. This will be a great chance to pick up some of Gage’s older work at great prices! Eileen's painting Fanny Hill is included in this exhibition of art inspired by banned or threatened books at the African American Museum and Library at Oakland, 659 14th Street, Oakland, CA, 510.637.0200, from Sep 5 – Dec 31, 2008. Open Tuesday-Saturday 12-5:30 pm. Banned & recovered features work from more than 50 artists working in a variety of media. Participating artists interpret a censored text of their choice. The project provides a unique forum for visual artists to respond to the suppression of literary art. ArtZone 461 Gallery is proud to be a hosting venue for Phase 1 of Litquake's Lit Crawl 2008, a part of the San Francisco Literary Festival. A panel from the Stanford Humanties Center will be taking a deeper, humanistic look at environmental concerns. Speakers Jon Christensen, John Felstiner and Dagfinn Føllesdal are moderated by Kirsten Oleson. Saturday, Oct 11, 6 - 7pm. Valencia Street, ground zero of the burgeoning Mission District in San Francisco, bustles with a cacophony of sights, sounds and interactions: the streets swarm with creatively tattooed twenty-somethings, local Latinos exchanging stories in Spanish, shopping cart-equipped street people and young professionals returning to their refurbished Victorian condos after a day at their jobs in the Financial District. Gourmets from other areas of San Francisco dodge the sidewalk action as they hunt for the storefront of the latest, cutting edge restaurant or check addresses for yet another new clothing or furniture boutique. Soda Cans is the initial project in an upcoming series of marble objects by Agelio Batle. Using art history's most regal of materials, Batle's Soda Cans are both irreverent and provocative. They wink back at Greek and Roman sculpture while asserting marble's place in contemporary design. The Soda Cans are also functional: lifting the lid reveals a perfect space for small storage! ASB Workshop is currently accepting reservations for Soda Cans. Nenad Kostic is one of 8 artists in the US premiere of the Beyond Theory Project, an exhibition of paintings, video, and installation works and an opening weekend of performances and discussions by artists whose work reflects contemporary art-making in Serbia. The artists and curator will be in residence for 10 days at Sushi Performance & Visual Art, San Diego, CA, 619.235.8466. Opening Reception Saturday, Nov 15, 7 - 10 pm. The Beyond Theory project is representative of a cultural-political shift that occurred in Serbia at the beginning of the 21st century. Jane Fisher’s Down Time opening is featured on the ArtBusiness.com website for San Francisco Art Gallery opening reviews of October 25, 2008. Alan writes: “Twenty-year survey of paintings and works on paper by Jane Fisher, portraits and figure paintings for the most part, all adept. What gives Fisher's work depth and bite is that you know there's a story behind each piece -- either the one she tells you or the one you make up yourself”. Jane Fisher’s exhibition is reviewed by Chérie L. Turner in her Nob Hill Gazette column A Fine View. Turner writes: “Loose brushstrokes of bold color capture tense, complex, contemplative, sometimes amusing or strange situations with people who often directly engage the viewer. Fisher’s mastery of medium and color, and ability to capture the psychological state of her subjects, even in the most ordinary of settings, results in beautifully captivating imagery”. Lincoln Center Theater commissioned Jane Fisher to create a painting to be used to promote their latest production Saturn Returns. The planet Saturn's orbital return to its position at the moment of a person's birth happens every thirty years. 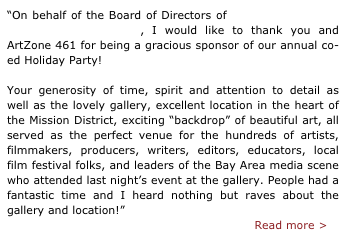 Playwright Noah Haidle uses this phenomenon to take a look at one man during these pivotal moments - a three different stages of his life - as he confronts the three women in his life. Saturn Returns is on stage at the Lincoln Center Theater in New York until January 4, 2009. Jeong Im Yi’s seventh solo exhibition opens in December 2008 at the NoAm Gallery, Seoul, Korea. She has exhibited solo exhibitions at the Sungkok Art Museum, Seoul, the Nabis Gallery, Tokyo, Japan; and various art galleries in Seoul. Jeong-Im Yi received her M.F.A in Painting in 2004 from the San Francisco Art Institute, San Francisco, California, and an M.F.A and B.F.A from the Painting Department at the Hong-Ik University, Seoul. Yi exhibits extensively in group exhibitions in Korea and the United States. Yi was a finalist of the ArtLink@Sotheby’s International Young Art Program 2000 and the Korea Now 2008 (Sotheby's Tel Aviv). Agelio Batle’s search for a true “live-work” space in San Francisco and it’s development into a home for Agelio, his wife, Delia, and their two young sons is described in this article by Zahid Sardar, the San Francisco Chronicle design editor. Photos by Eric Luse and Joel Puliattti. Agelio’s works will be featured in Heads and Tales, an ArtZone 461 exhibition from Dec 6, 2008 - Jan 18, 2009. Eileen’s painting and essay, both titled The Things that Had Come to Rest There, are included in the Winter 2008/2009 issue of the Whitefish Review, a new literary journal from Whitefish Montana that focuses on art, literature and photography. In the essay, Eileen writes about herself as a painter and the motivation behind her Urban Landscrapes series. She also provides an in-depth commentary on each element of the painting and her choice of mixed painting styles. Congratulations on being selected for publication! Gage is teaching an 8 week Drawing and Painting with Pastels class for beginning and continuing artists, starting Wednesday, January 21st at the Sharon Art Studio in Golden Gate Park. In addition to the honor of having three Gallery Artists’ work presented in the Exhibition, Agelio’s work on panel, Black Growth, was selected BEST IN SHOW by Juror Michael Bishop. Michael is the Art and Art History Department Chair at California State University - Chico where he has taught since 1978. The Exhibition runs from January 10 to February 6, 2009 and is open to the public. Please see the Crocker-Kingsley web site for hours and details. Two Agelio Batle works, Black Growth and Brother 4, Gage Opdenbrouw’s painting Spring Day and Linda Raynsford’s sculpture Swollen have been selected for the 75th Crocker-Kingsley Juried Art Exhibition and are on display at the Tsakopoulos Library Galleria in downtown Sacramento. Congratulations to all three Gallery artists! The Exhibition has 30 two-dimensional and 30 three-dimensional works that were chosen from over 1,000 works submitted by 578 California artists. It covers a diversity of media and a range of artistic styles from representational to abstract to conceptual. Linda’s sculptures, shown in Nov 2008 with John Yoyogi Fortes’ paintings at Pamela Skinner / Gwenna Howard Contemporary Art in Sacramento, CA, is reviewed by David Roth in Art Ltd’s Jan/Feb 2009 issue. 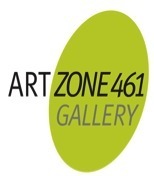 Several of Linda’s sculptures shown in Sacramento along with her recent works will be shown in ArtZone 461’s Main Gallery from April 18 to May 25..